Once again, our partner and major contributor, Luxury Link, held a vacation auction on behalf of PfaP. This time, 100 percent of the proceeds, which added up to over $2,200 dollars, went to Pack for a Purpose. 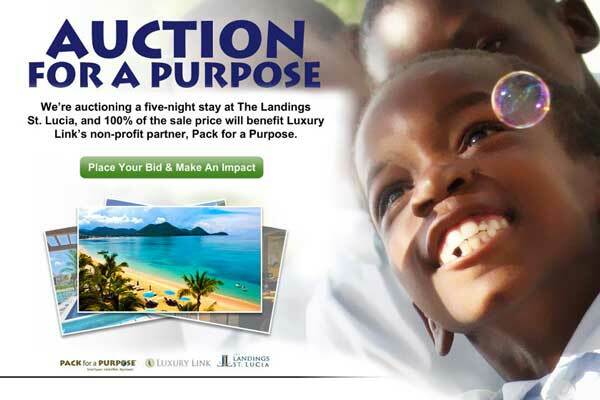 The Landings at St. Lucia, one of the lodgings on the PfaP website, generously donated a fabulous five-night luxury package for the auction. The project that The Landings supports is The Grow Well Center, a volunteer-based charity that cares for at-risk children with social support needs through C.A.R.E. (Center for Rehabilitation & Education) and the Gros Islet School.